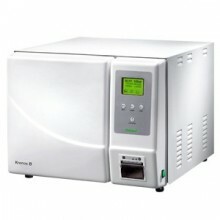 The Newmed Kronos 18 L is an ideal autoclave for any dental decontamination area needing to meet the HTM 01-05 regulations. This is a fractionated double stage vacuum pump. Click the button below to add the Newmed Kronos B Autoclave (18L) to your wish list.